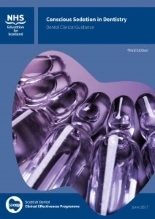 The Scottish Dental Clinical Effectiveness Programme (SDCEP) guidance on conscious sedation in dentistry was first published in 2006 . The aim of the guidance is to promote good clinical practice through recommendations for the provision of conscious sedation for dental care that is both safe and effective. An update of the guidance was published in June 2017. The full guidance document can be downloaded from the SDCEP website.